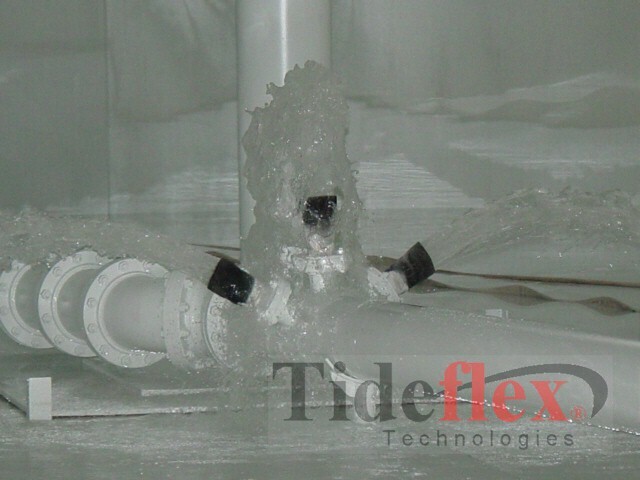 The Tideflex Mixing System (TMS) has been installed in over 2,000 tanks and reservoirs as small as 2,000 gallons to over 20 million gallons and has been proven to improve storage tank water quality. The TMS has been installed and proven effective in every tank style including circular, rectangular and irregular-shaped reservoirs, standpipes, and dry and wet riser elevated tanks. The reasons for the extensive use and approval of the TMS are it’s PASSIVE AND PROVEN with unparalleled ENGINEERING SUPPORT. PASSIVE: The TMS does not require maintenance and uses the energy of the fill and draw cycles to eliminate short-circuiting and achieve complete mixing, passively, without the need for an outside energy source. Given the maintenance burden of distribution systems already placed on water utilities, very few are interested in installing mechanical mixers in storage tanks due to maintenance and inspection requirements. PROVEN: The TMS has been extensively CFD and Scale modeled for every tank style. And, the TMS has been validated to improve water quality by owner-conducted field sampling and monitoring of parameters such as temperature, residual, TTHM, HAAS, pH, DO, nitrites, nitrates, and HPC. ENGINEERING SUPPORT: For every tank, Tideflex Engineers determine the optimum TMS configuration (based on CFD and Scale modeling), and run Manifold Hydraulics Mixing Analysis Models. The Mixing Analysis shows the owner exactly how much tank turnover is required to achieve complete mixing. For existing tanks, Red Valve reverse-engineer’s the TMS to ensure complete mixing based on how the tank is actually being fluctuated. What Problems does the TMS solve? The increase in distribution system regulations, such as the Stage 2 Disinfectants and Disinfection Byproduct Rule (Stage 2 DBP rule), and the increased use of chloramination have put more of an emphasis on the water quality impact of distribution systems, including storage tanks. The TMS is an extensively modeled and validated multi-port mixing system that has proven to eliminate water quality problems such as loss of residual, bacteria regrowth, nitrification, DBP spikes, taste and odor problems, increased HPC, and pH and DO variation.